Zion Market Research has published a new report titled “Electrical Discharge Machine Market by Product (Die Sinking EDM, Wire Cutting EDM, and Small Hole EDM), and by End-Use Industry (Aerospace and Defense, Manufacturing, Automotive, Healthcare, and Others): Global Industry Perspective, Comprehensive Analysis and Forecast, 2017 – 2024’’. 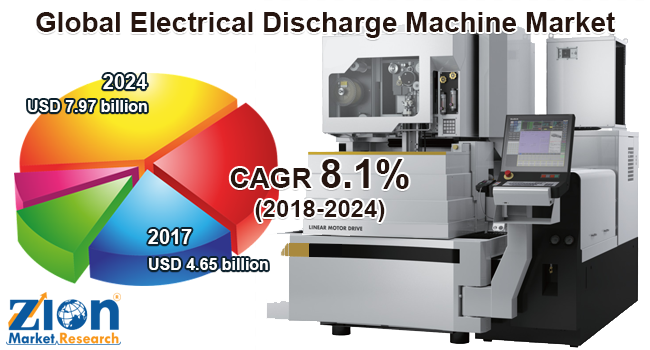 According to the report, global electrical discharge machine market was valued at around USD 4.65 billion in 2017 and is expected to reach approximately USD 7.97 billion in 2024, growing at a CAGR of slightly above 8.1% between 2018 and 2024. Electrical discharge machining is a process of removing desired material from any workpiece by inducing the electrical spark in between workpiece and electrode. The created electric spark induces immense heat ranging from 8000 to 12000°C, which can melt almost any material. Wire cutting EDM is a high precision method for cutting nearly any electrically conducting material. Wire cut EDM process is significantly opted by the automotive industry for various metal mold applications such as molding steel headlights. Automobile manufacturers highly prefer EDM procedure as it ensures molding and drilling of the largest automotive part too. Globally, the automotive sector attained the value of USD 61.85 billion in the year 2012 and is anticipated to account for the value of around 90.49 billion by 2020. In the year 2017, nearly 98.9 million motor vehicles were produced worldwide. The automotive sector has been estimated to be the highest growing segment in the forecast period. China is observed to be the major contributor in driving the market demand due to the flourishing automotive sector of the region that accounted for USD 15.75 billion in 2017. The decent rise in the automotive industry has simultaneously accelerated the market demand of electrical discharge machines. However, the EDM is quite a complex procedure involving numerous stages. Involvement of a large number of devices results in increased raw material and manufacturing expenses. High manufacturing expense is restraining the market growth to some extent. The electrical discharge machine market is categorized based on product, end-user industry, and geography. The product segment of the electrical discharge machine market includes die sinking EDM, wire cutting EDM, and small-hole EDM. The wire cut EDM is observed to be the largest market share holder and is anticipated to grow remarkably in the upcoming years as well. The main reason for the highest growth rate is diversified benefits offered such as reduced cost, high reliability, and stress-free cutting facility. The wire cut segment is anticipated to attain CAGR of more than 8.4% in the forecast period. EDM is implemented in various end-use industries for diversified applications, some of the major end-use industries are aerospace and defense, manufacturing, automotive, healthcare, and others. The automotive segment is anticipated to be the highest growing segment due to boosting demand for automobiles in numerous emerging countries globally. Regional segmentation of the electrical discharge machine market includes North America, Europe, Asia Pacific, Latin America, and the Middle East & Africa. North America is observed to grow significantly due to the presence of major players of metal industry such as Nucor and Alcoa. Numerous local and international manufacturers are focusing on developing low-cost EDMs, thereby making the market substantially competitive. Globally renowned major players involved in EDM manufacturing are Aristech, CERATIZIT, CHMER, EchoENG, EXERON, GF Machining Solutions, Heun Funkenerosion GmbH, OEMARS, KAAST Machine Tools Inc., and Kent Industrial, among others.